SHOULD YOU BUY AFTERMARKET PARTS? You’ve had an accident, or your car needs repair for another reason. You have choices to make. Which parts should you buy — new OEM (produced by your vehicle’s manufacturer), Aftermarket, Used, or when available, Remanufactured? Sometimes, the insurance company makes the choice for you unless you’re willing to pay additional fees to get what you want. Usually, new OEM parts will cost more than any of the other options. Sometimes, OEM parts are better than the other new options; sometimes they’re not. In fact, certain Aftermarket parts actually exceed the quality of some OEM parts. The trick is knowing when that’s the case and when it isn’t. And it gets a little more complicated. There’s only one manufacturer of Ford OEM parts, for example, and you usually buy their parts at a Ford dealership. Aftermarket parts are manufactured by thousands of different companies, and you can buy them from thousands of different sources. Some of the Aftermarket manufacturers produce outstanding products that are even better than the OEM parts. These parts aren’t always cheaper than the OEM parts, but when they’re not, their price is often justified by the higher quality of the products. Other Aftermarket parts are really good and available at considerable savings to the consumer. The key is determining which manufacturers’ parts fall in this category because there are other manufacturers whose parts are very much hit and miss. Sometimes they fit; sometimes they don’t. Their quality isn’t really up to reasonable standards. Putting those lower-quality parts on a nice vehicle can cost you more in reduced vehicle value than what you save on the parts. At Auto Parts of Shelby, we sell Used, Aftermarket, and Remanufactured parts. What’s more, we would use any of the 3 types of parts on our vehicles. In fact, we do just that. We started selling Aftermarket parts in the mid-80s. To be frank, the parts we sold then weren’t that good. But they were the best we could find then, and they were quite inexpensive. Since that time, more manufacturers got in the Aftermarket parts business, and the cream rose to the top as it usually does. 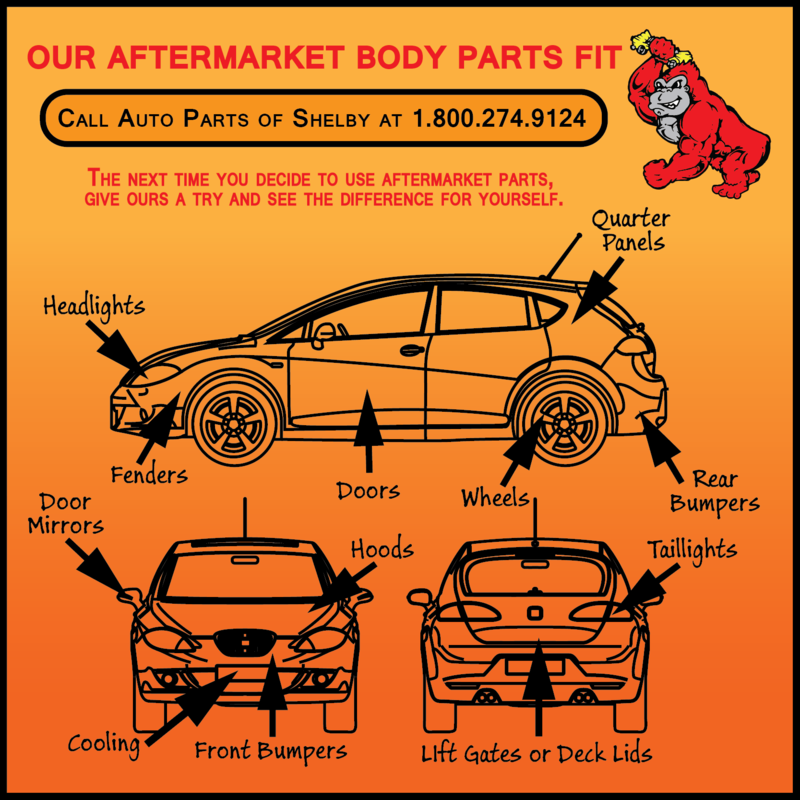 We’re proud of the quality of the Aftermarket parts we sell today. They look good, they fit, and they save our customers money. Give our Aftermarket parts a try and see for yourself.